Toilets are not the kind of things you purchase daily, since it’s a long-term investment, you’d definitely want to make sure your money doesn’t go to waste (the irony…). Flushing toilets are mainly attached to the central sewage system of your residence, it should ideally remove solid waste with a single flush and that too, without being overtly noisy. Flushing power, dual flush or single flush, gallons per flush – these are the parameters that define the actual performance of the flushing toilet. The new EPA WaterSense requirement of 1.6 gallon per flush required manufacturers to bring some remarkable alterations in the design of their models. So, the question is, how do you find the best flushing toilet? Only the right information can help you through this. 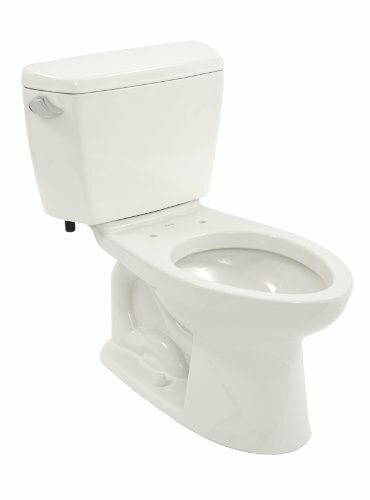 What Type of Flush to Look for? Looking at the variety of designs and technologies Toto has put on display, calling it one of the best flushing toilet manufacturers of this era doesn’t seem like an overstatement. An independent lab test proved that Toto Supreme’s maximum performance flush rate is 1.6 gallons of water per flush. Gravity pull teamed with robust centrifugal force creates a cyclonic flushing power that effectively rinses away solid waste from every inch of the bowl. The 3-inch flushing valve (larger than the conventional 2-inch valves) transfers water from the tank to the rim nozzles at a formidable speed. The elongated bowl shape provides greater comfort to your knees and bottom than standard round shaped models. The American Standard Champion-4 is a mighty waste-eating beast, featuring the largest accelerator flush valve (4-inches) in all toilets. It is a gravity flush type toilet with a siphoning bowl that jets the waste through the spacious waterway in a cyclonic speed. The fully glazed siphon trapway measures 2 3/8 inches, which is also the largest in its class. It claims to remove 70% more solid waste than any other toilet in the same class. Its special EverClean glaze coating on the toilet surface blocks the growth of sticky stains and odor-causing bacteria around the seat. People of every height and body weight experience optimal comfort on the ADA-height compliant seat. The next toilet in my list is a WaterSense certified (water saving toilet) model from Toto. The 1.28 GPF water intake doesn’t hinder the cleaning ability of the system. The ceramic bowl coated with Toto’s exclusive Sana Gloss inhibits the build-up of bacteria and microbes that cause toilet stink. As a result, what you get at the end of every flush is a hygienic, crystal-clean toilet. There’s nothing that can’t glide through the 2 1/8 inch trapway, therefore, clogging is something you’re rarely like to face with Toto Ultramax. In the duopoly of Toto and American Standard, Danze Orrington is one such brand that has formed a niche for itself. 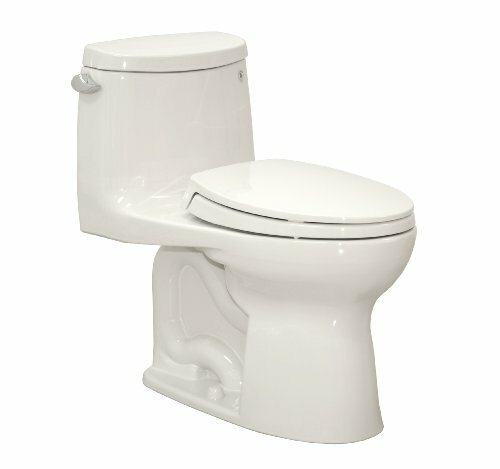 Its super water efficient technology framed inside a classy, elongated toilet model should easily be a prized possession inside your bathroom. The ADA compliant 16.5 inches seat height gives you ultimate comfort and optimal support on your back, hips and knees. The angle mounted tank lever makes flushing and maintenance incredibly hassle-free. 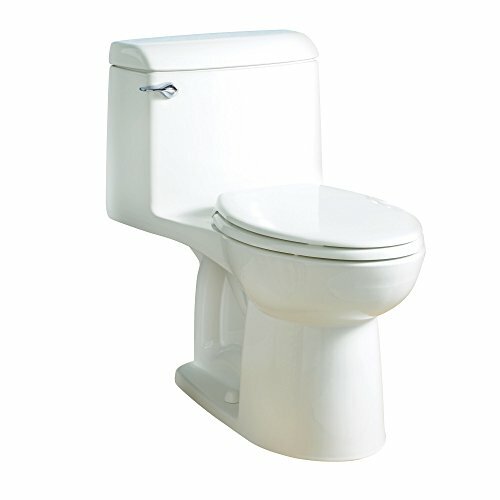 Moreover, being a one-piece toilet model adds an edge over standard toilets in terms of installation. Having a 3-inch flush valve, an inch larger than the traditional 2-inch valves, creates a super strong flushing power. This increased flushing power still only uses 1.28 gallons per flush! The Toto Drake II’s double cyclone flushing system is the lifeline of this wonderful water efficient model. The 2 nozzles jet down the water in the bowl in exhilarating speed for flawless flushing action around the rim and bowl wall. Special credit goes to the 1.28 GPF maximum flushing rate that helps save valuable water. It also saves you a ton of time cleaning and maintaining this toilet thanks to the Sana Gloss coating on the bowl. This gloss coating prevents stain build-up and development of bacteria and fungi, ensuring indelible sanitation in your bathroom all day long. Staunch siphonic dual flush type toilets are the champion when it comes to engaging the most impactful flushing technology in modern, well-furnished bathrooms. In this American Standard model, the primary flushing (or full flush) rate is 1.6 GPF, whereas, the secondary flushing (or half flushing) capacity is 1.0 GPF. While the latter option can steadily eliminate liquid waste with a single flush, opting for the full flush mode will wipe off stains from the most obscure corner of the bowl without going overboard with water consumption. The best flushing toilets in the market can be characterized by one common feature, less use of water per flush. Premium range flushing toilets are capable of cleaning the bowl surface with less than a gallon of water, which not only means you save a considerable amount of money on your water bill, but also positively contribute towards natural resource conservation. Successful utilization of the double cyclone flushing technology in modern flushing toilets has empowered them with even greater flushing force. A half-cleaned toilet bowl is the ultimate harbinger of the worst nightmare imaginable for party hosts. Leave aside the visual horror, what about the odor created by the residual build up that seems to tear apart your olfactory nerves? Fortunately, these thoughtfully designed toilets flush the waste immediately from the bowl, ensuring no residue is left over to cause a stink. Another reason you should definitely consider buying a flushing toilet is freedom from the pathetic chore of scrubbing the toilet bowl frequently. The steady flushing system ensures the bowl remains clear and hygienic with every flush on its own. The next notable benefit of installing a well-designed toilet is personal comfort. From rounded to elongated toilet bowls, the best flushing toilet manufacturers efficiently cater to your versatile toilet needs. Chrome plated models are specially known for adding an extra layer of stability to the trip lever. Lastly, we shouldn’t forget acknowledging the lessened expenses on maintenance and repairs. High quality toilets reduce clogs, maintainence repairs, thus saving you a ton of money down the road. Therefore, you won’t have to put the plumber’s number on your speed-dial anymore. What style and design of bowl will maximize your comfort should be a big concern for you. A majority of households in many countries use gravity wash down or siphonic style toilets for the money which channelize air in the bowl through the sewage system followed by flushing down the water through the pipe. The procedure causes mild noise and leaves almost no room for clogging. Another sub-type of toilet flushing systems is wash out toilets. These types are more commonly seen in luxury hotel toilets. In this case, a large trap filled with a small amount of water remains concealed beneath the main bowl. The trap opens and splashes water in the bowl with full force to thrust the solid waste down the pipeline towards the sewers. There are two basic categories of flush toilets according to the mechanism they are controlled by. Gravity flush toilets are known for their quiet operation and mostly devised in A-list models. The system rinses off the solid and liquid waste residue from the bowl by pumping out water and air from within the central pipe. While premium fixtures can actuate faster cleaning of large amounts of waste, more often than not, their budget counterparts fail to provide satisfactory output. Pressure Assist Flushing Toilets belong to the expensive category of flushing toilets. The technology used in these models require a complex arrangement of components to adapt with a specific household water pressure. A tiny water tank releases water and air in the bowl with great force to siphon off the dropping quickly. This is another major factor to evaluate carefully while searching for that perfect flushing toilet for your residence. Toilets with high-power flushing systems deliver excellent water efficiency. But these toilets demand a more intricate and staunch design to carry out the function properly on low water usage. You may also choose a dual flushing toilet with the combined goodness of both high water and low water flushes. It lets you conserve water by allowing to choose between normal full flush and low water flush options. There are two dedicated buttons for each function. The new regulation of toilets utilizing a maximum of 1.6 gallons per flush has prompted manufacturers to chalk out designs highly compliant to low water usage. For steady water conservation, look for a branded low water consumption model that uses 1.6-1.8 gallons per flush. The latest models of Toto have raised the bar by utilizing a technology that reduces the water volume to 1.0 gallon per flush. The physical design of the toilet should bring comfort to your knees, back and hips. 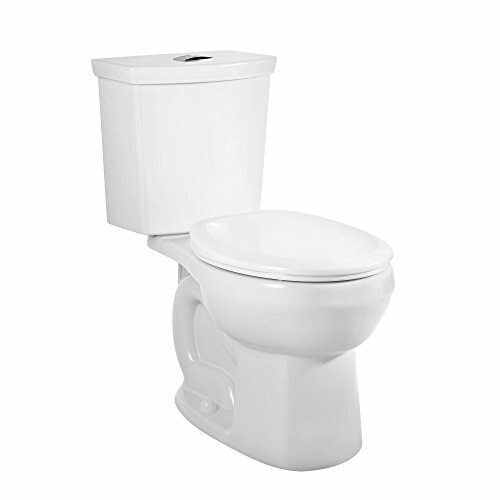 Round shaped toilets are extremely common in household toilets as they fit into small to medium bathrooms easily. 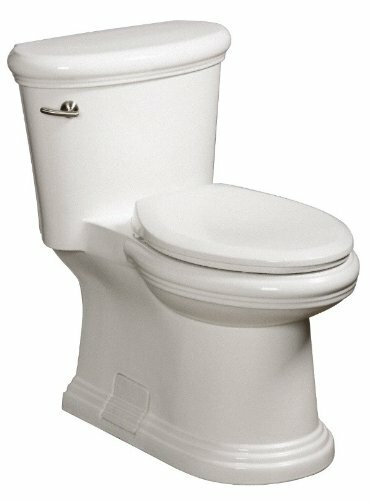 If you have sufficient room for a bigger toilet, an elongated flushing toilet will serve you the best. Those who don’t mind shelling out some extra cash can also consider high-end models offering custom options like customized seat height, flushing mechanisms etc. Coming to the mechanical design, components like trapway size, rim design and flush valve demand special attention. For faster and effective flushing, the larger the trapway size, the better. Reliable models use a fully glazed trapway measuring around 2 3/8 inches which releases a soothing fragrance after every flush. Seamless ream design with no small holes facilitates silent flushing. A standard 2-3 inches flush valve with a flush rate from 500 to 1000 grams is good enough to remove the stickiest poop stains from the toilet wall. Over the decades, the designs and mechanisms of toilets have gone through stark improvisations. The modern flushing toilets are exclusively designed to save water and aid noise-cancellation as much as possible during flushing. With so much change in the design, it’s obvious that plumbing requisites for these toilets have also altered remarkably. If your plumbing knowledge doesn’t expand beyond measuring the rough-in, don’t hesitate calling an expert plumber to tackle the job. Most toilets weigh more than 100 pounds now-a-days. In order to have a safer and steadier toilet experience, make sure to have strong anchors to fix the toilet to the subfloor. Don’t stop at that. Use studs to provide good support to the equipment on the floor. If you have chosen an ADA compliant toilet seat, the height of the bowl is going to be nearly 16.5 inches. In that case, the plumbing method might be a little more complex. Even if there’s a golden rule of finding the best flushing toilet, it’s yet to be caught on my radar. In a humble effort to save you the hard work of researching, I’ve tried explaining the major details as briefly as possible. All the products I’ve mentioned in the list are completely my own choices. Feel free to disagree anytime. As long as you have a basic idea as to how these toilets function and what technologies could maximize the sanitation in your toilet, you got the drift. The rest is left up to your judgement. Browse the web, visit hardware stores, check out a couple of products, compare their features and decide for yourself. Not as hard as it seemed earlier, right?